Today we travel to Santi Apostoli, the church of the Holy Apostles, to visit the tomb of apostles, Saint Philip and Saint James the Less. That we visit the church today on Friday of the Quattro Tempora di Primavera, is not by chance. This was traditionally a day when the public would approve candidates for the priesthood who would then come here to pray for guidance from the Holy Apostles. A church existed on this site from as early as the fourth century. In the sixth century it was rebuilt and dedicated to Saints Philip and James the Less when their relics were brought here from the East. It was later dedicated to all the apostles. An addition to the tombs of Philip and James the Less, here too are the relics of martyrs moved from the Apronian catacombs. Pope Stephen IV is said to have helped in moving the relics himself, walking barefoot through the city carrying them on his shoulders. 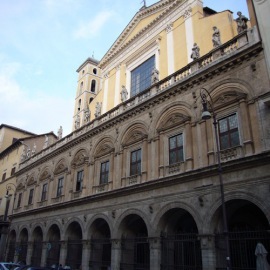 A priest by the name of Father Felice served at this church before taking the name Pope Sixtus V. He would then go on to help create the Rome we know today by leveling much of the medieval city and building magnificent churches connected by grand boulevards. Another person who helped shape Rome, Michelangelo, spent his last days living nearby and used this church as his parish. When he died, he was buried in this church. His body was later moved, some say stolen, to Florence where he is now buried in the church of Santa Croce.